Indium Corporation Talent Acquisition Coordinator Jim McCoy speaks to a group of students at the SUNY Poly National Manufacturing Day Expo. Since October, Pathways in Technology Early College High School (P-TECH) Oneida-Herkimer-Madison (OHM) BOCES students have analyzed, brainstormed, and designed a real-world product packaging solution for Indium Corporation, Utica's Technology Company®. "We challenged the P-TECH students to develop a solution to an actual product packaging challenge that affects quality, cost reduction, and customer satisfaction," said Jim McCoy, Indium Corporation Talent Acquisition Coordinator. Indium Corporation engineers met with the P-TECH students Wednesday to review their final report and recommendations. "The solutions that these students generated really impressed us," McCoy said. "It is clear that these young technologists have bright futures and that the P-TECH program is working." P-TECH is a public-private partnership that will prepare more than 12,000 New York students for high-skills jobs of the future in technology, manufacturing, healthcare and engineering. OHM BOCES is one of 26 New York State P-TECH partnerships offering the innovative 9-14 model to students across the state. P-TECH OHM, in its first year, is a partnership among Mohawk Valley Community College, Mohawk Valley EDGE, Indium Corporation, ConMed, CryoPure Corporation, J. H. Rhodes Co., Inc. and Trenton Technology. 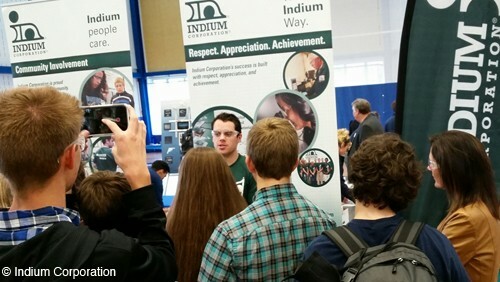 "Indium Corporation is committed to both local STEM education outreach and to delivering highly competitive and effective solutions," said Rick Short, Indium Corporation's Director of Marketing and Communications. "This project is exceptionally meaningful to the students' education and to our business as it involves an authentic real-world challenge. This work offers students the chance to make a significant difference in an actual global business situation." According to Tiffany Piatkowski, STEM Integration Specialist and P-TECH OHM Lead Instructor, this model is extremely beneficial to students: "This challenge is the embodiment of what strong business and educational partnerships can achieve. Our students are walking away from this experience with more knowledge and confidence to boost them to a successful future." As a lead P-TECH sponsor, Indium Corporation expects to continue working closely with this program in the years to come. For information about the P-TECH program, visit www.oneida-boces.org/PTECH.